My husband and I love road trips. Something about them makes the journey almost as much fun as the destination. But, we haven’t been able to take one in a while. So, we decided to spend Spring Break on a New Zealand road trip across the North Island. I was beyond excited! We were gone for 10 days and had a blast! 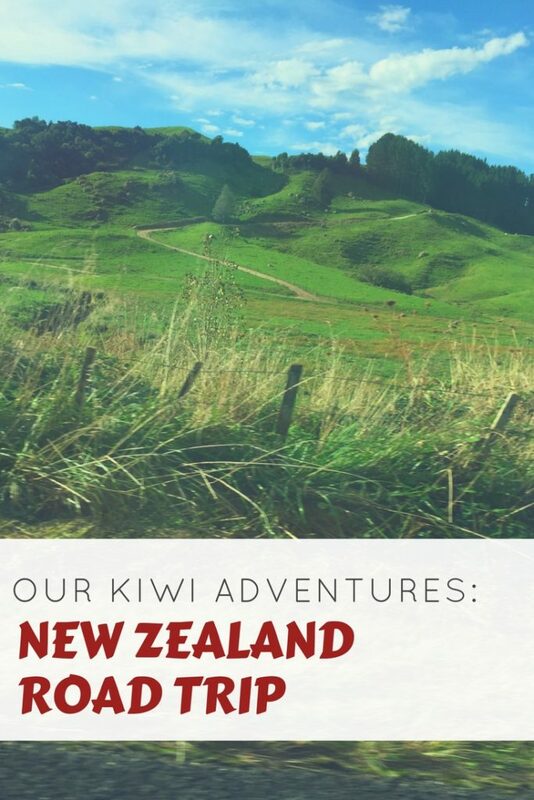 Read on to find out more about our kiwi adventures! Day 1: Let the Adventures Begin! On departure day, Chris had to work until 3:00 pm. I left work at noon, went home and loaded up the car. A friend of ours agreed to drive us to the airport. We picked Chris up and headed straight there. Our flight left at 4:15 and we had plenty of time to check in and fill out customs forms. I love living on a small island with a tiny, laid-back airport! To get from our home island to Apia, Samoa, we took a small 8-seat Talofa Airways plane. This was our first time flying with Talofa, but it won’t be our last. Before we knew it, we were in a taxi heading to the Sheraton Samoa Beach Resort. 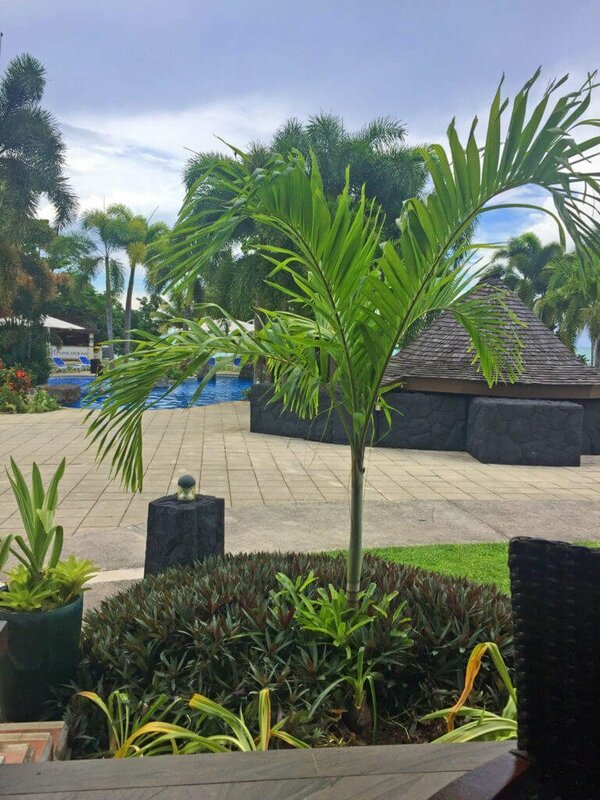 The Sheraton Beach Resort is a beautiful ocean-side resort with gracious staff and no crowds! It is located only 5 minutes from the main airport. After checking in and dropping off our luggage, we headed to the resort’s open-air restaurant. 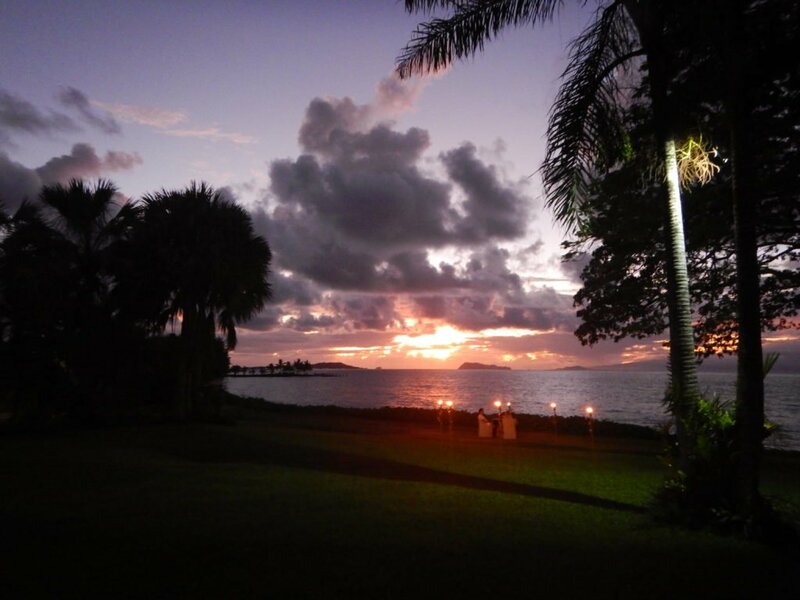 We had a delicious dinner while relaxing to the sounds of the ocean and views of a beautiful sunset. What a wonderful way to start a vacation! Because our flight didn’t leave until the afternoon, we were able to wake up without an alarm clock. I got up early and sat on the balcony watching the waves while Chris and Boston slept in a little. After breakfast, they went swimming in the pool while I took pictures. Around noon, we packed up, checked out and ate lunch. About 1:45, we headed to the airport. 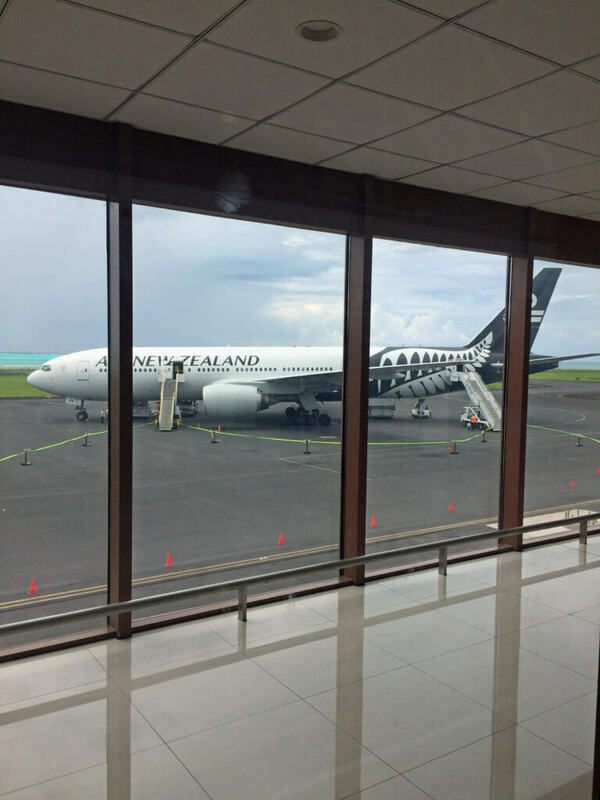 We flew Air New Zealand for the first time. This is my new favorite airline! Their planes are roomy and comfortable with tablets in the seatbacks and footrests. They also have soft blankets and the best headphones. The staff is wonderful. Quickly after takeoff, they come through the cabin with water. The lunch they served was actually good. 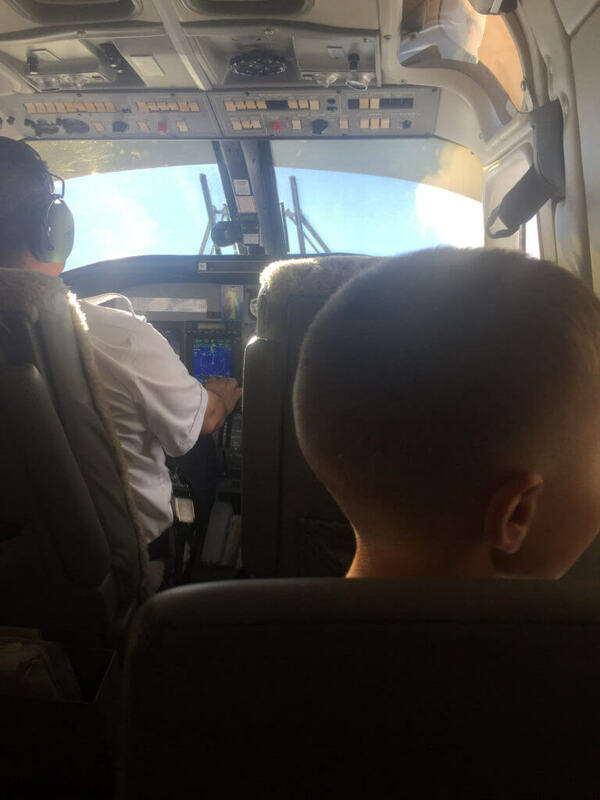 Before landing, they handed out candy. 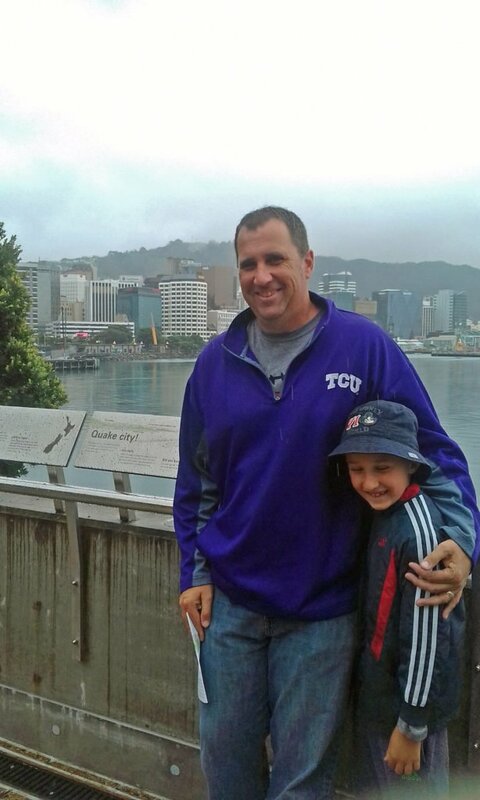 Once we arrived in Auckland, we had a smooth jaunt through immigration, baggage claim, customs, the rental car counter, and the money exchange booth. Before long, we were in our rental car and starting our New Zealand road trip! We decided to go old school this trip and navigate using an old-fashioned map. We had a few hiccups during the week, but for the most part, this worked well thanks to New Zealand having great signage. Driving on the left was a little stressful at first. 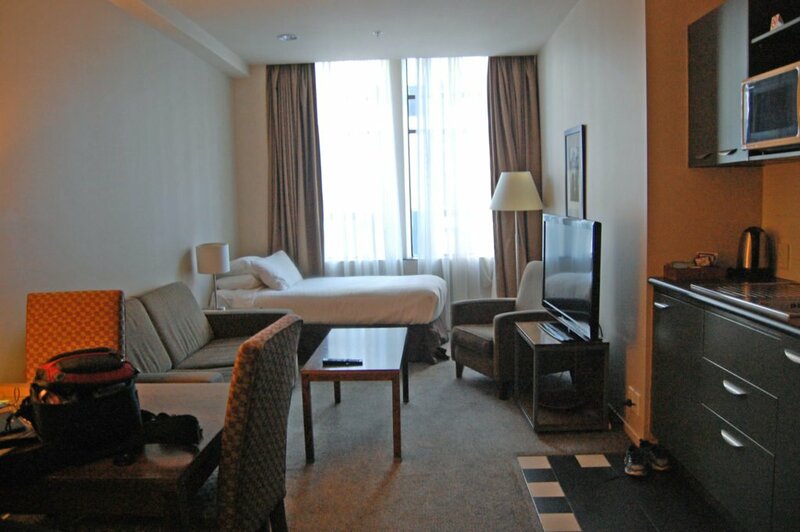 Our first hotel of the trip was in downtown Auckland. By the time we got there, it was dark but still busy. Driving on the wrong side of the road, combined with not being 100% sure where we were going, and the hustle and bustle of the city after dark had Chris rattled. We drove around in circles for a while before finding the hotel and a place to park. But we finally made it to the Scenic Hotel Auckland. The hotel was small, cozy, and the perfect size for us. 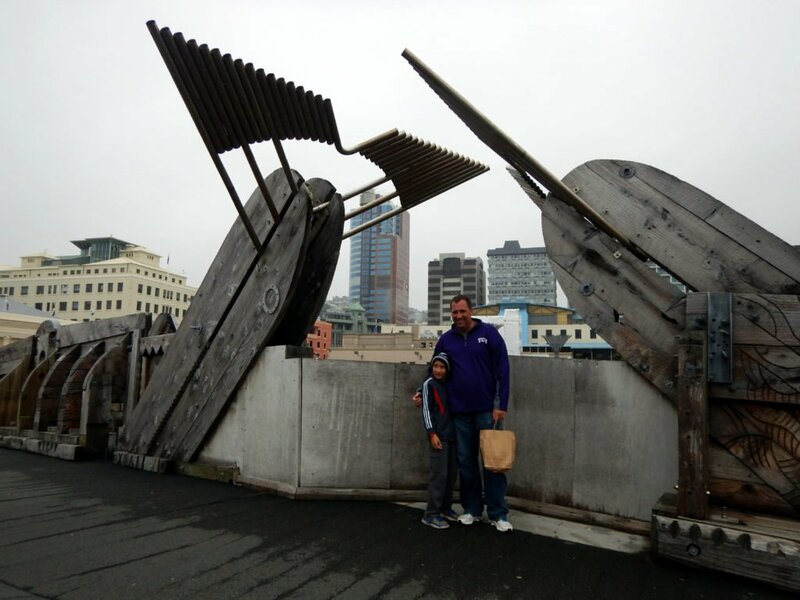 We loved that it was right in the heart of downtown Auckland. Once we got checked in, we were too frazzled to eat, so we just hit the hay. Tomorrow the fun really begins! We were up and out by 7:00 am this morning. Everyone was excited to start exploring. We had a busy day planned. Breakfast was at Rosie’s in the Parnell neighborhood. This was a small bustling cafe filled with locals. It was a little too fancy for our tastes however. Their menu did not cater to the picky American tastebuds of my son. The plan was to go to the Kelly Tarlton’s Sea Life Aquarium first. We had some time to kill before it opened, though, so we drove down towards Mission Bay. We found a park on the edge of the ocean and checked it out. This was the first of several parks we would visit this trip. Boston enjoyed chasing the seagulls and climbing on the playground equipment. We had some gorgeous views from here too. After running around in the park, we headed to the aquarium. We were the first ones in line when they opened. We loved this aquarium. It was awesome! My favorite exhibit was the shark tank. Boston loved the penguins. Chris was fascinated by the giant lobsters. 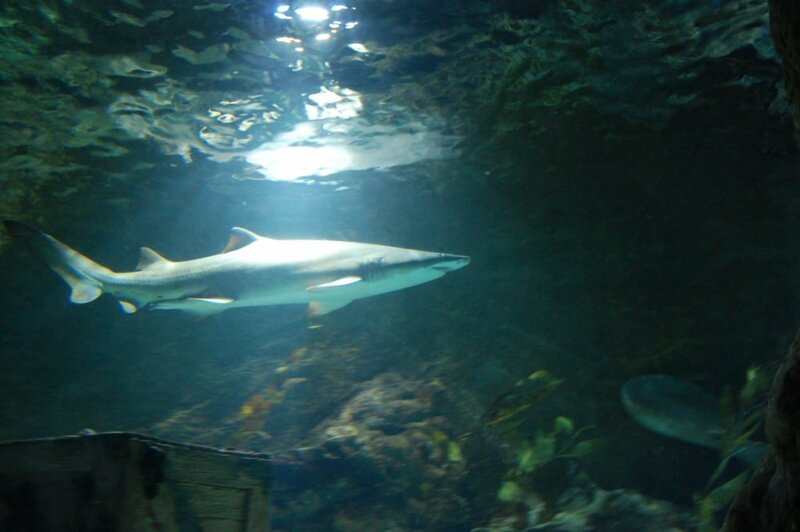 You can read more about our thoughts on the aquarium here. This is definitely a must-do. Next up was the Auckland Museum. We could have spent the whole day here! 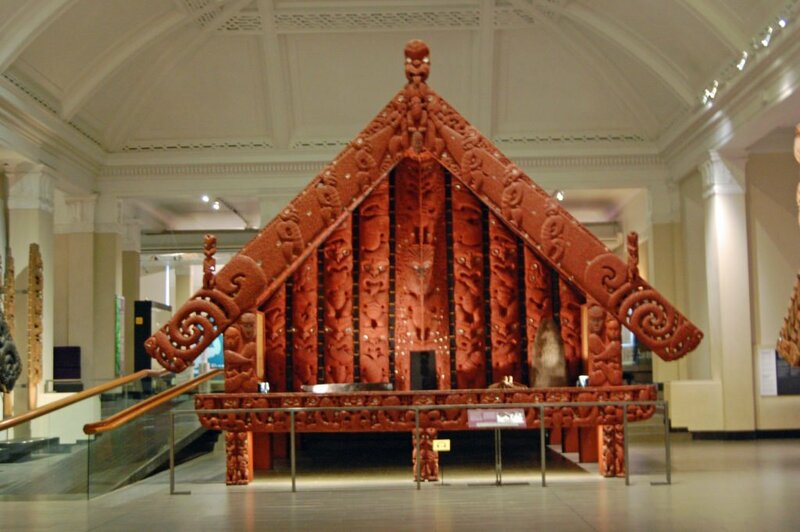 The entire first floor is focused on the Maori culture and history. Boston liked the war planes but was scared by the volcano demonstration! Chris and I found the museum very interesting. We were so busy with the museum, we completely skipped lunch! After we left the museum, we headed back to the city center. We parked and walked to the Ferry Building. Boston was hungry, so we grabbed a snack. We took the ferry to Devonport, which was fun. It started raining during our walk to the ferry, so it was nice to be inside a boat instead of out in the wet weather. By the time we got to Devonport, the rain stopped. We walked along the coast to Torpedo Bay Navy Museum. This was high on Boston’s list of things to see. 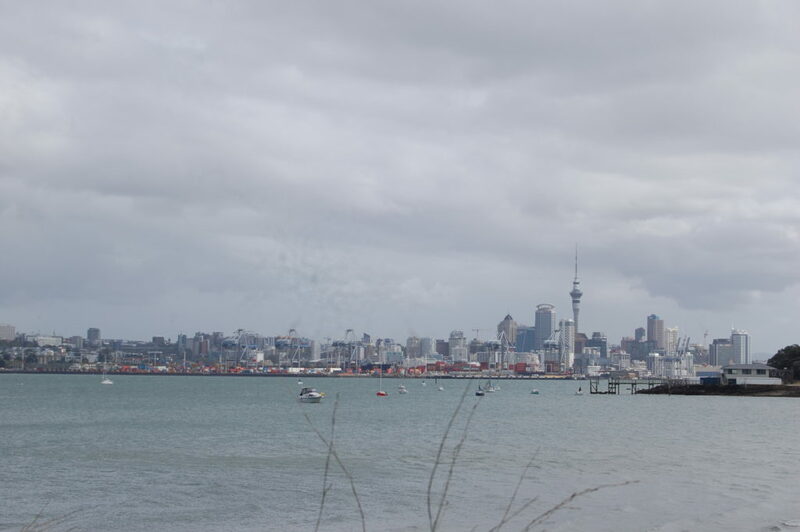 The walk gave us some amazing views of Auckland. The Navy Museum is small but free and interesting. It has lots of model ships. Boston enjoyed trying on an officer’s uniform. See more on the Navy Museum here. While at the Navy Museum, we got ice cream. I chose summer nectarine, which was the yummiest ice cream I have ever had! It is so creamy and bright. We ate our ice cream on our walk back to the ferry. Once back in Auckland, we ate dinner at Brew on Quay. This was right up our alley. The burgers were huge! Chris enjoyed his beer flight. His favorite was Parrot Dog. After dinner, we went back to the hotel. Boston and I went to bed early, while Chris went for a walk. All in all, we loved our day in Auckland. We checked out of the Scenic Hotel at about 6:30 am to begin the road trip portion of our trip. We drove to Hamilton, which was about an hour and a half from Auckland. Breakfast this morning was at Cafe Agora in Hamilton. This was better than Rosie’s, but was still a little too gourmet for us. Boston was able to get a plain sesame bagel here though. 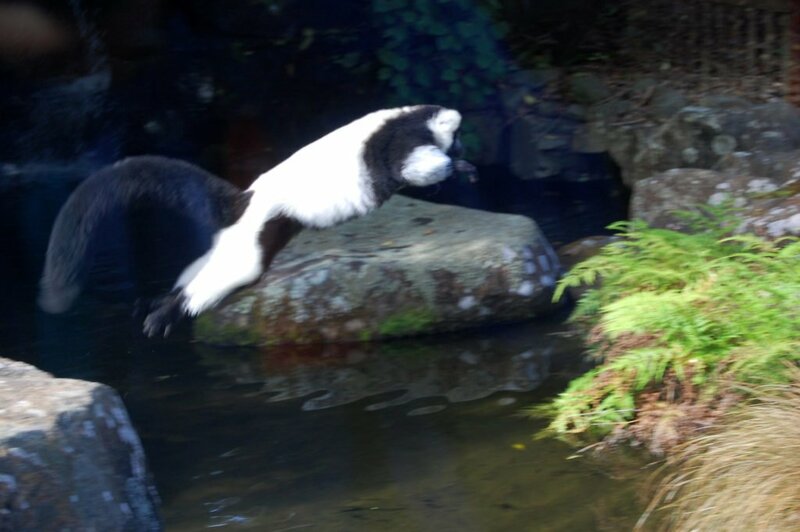 A ruffed lemur jumping over the stream. After breakfast, we visited the Hamilton Zoo. This is a small zoo, and I didn’t expect much. However, it exceeded our expectations. It is a great little zoo and not crowded at all! Boston loved the meerkats, while Chris and I enjoyed the red panda and ruffed lemurs. We even got a one-on-one talk with a zookeeper about the meerkats. What a fun morning! 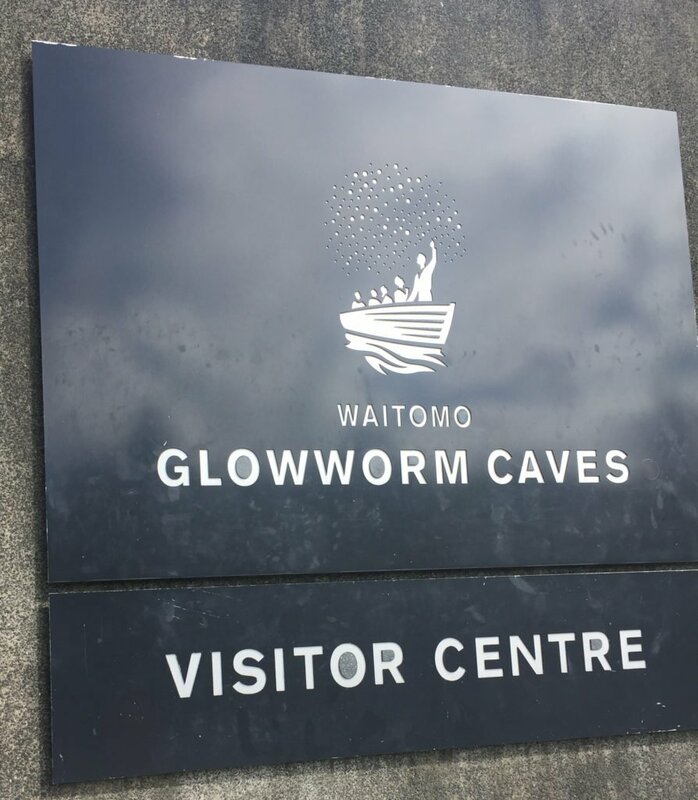 After we left the zoo, we drove another hour to the Waitomo Glowworm Caves. This was the one thing I really wanted to do! New Zealand is the only place in the world to see actual glowworms! I worried that we wouldn’t be able to get in since I didn’t book a tour in advance, but we had no trouble at all! We took the 45 minute guided tour down into the cave where we learned about the caves before climbing into a rowboat in the dark to see the glowworms. It was incredible! This was one of the coolest things I have done in my life! We next began the 4 hour drive to Whanganui, our stop for the night. This gave us a chance to see some of the beautiful countryside! 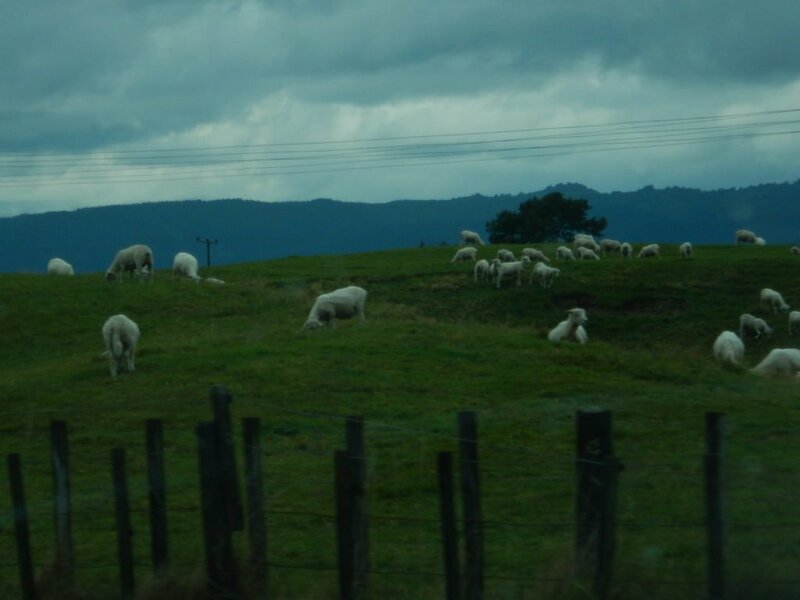 We finally saw some sheep! We stopped for dinner at Mr. Pizza’s in Taumarunui. This was a small place, but the pizza was wonderful. Chris and I shared a ham and potato pizza while Boston had pepperoni. Unfortunately, we hit the mountains after dark, which made driving more difficult. We finally got to the Aotea Motor Lodge at about 9:00 pm. Our room had a hot tub, so Boston insisted on getting in before bed. Another amazing day in New Zealand. After getting up this morning, we checked out of the hotel. It rained off and on all day and was chilly, but we didn’t let that dampen our fun. After a couple of disappointing breakfasts, we decided to do something familiar–we went through the drive thru at Burger King. However, this was difficult because the drive thru line is backwards because of the steering wheel being on the opposite side of the car. It took Chris and I both to navigate it correctly! First stop: Kai Iwi Beach. This was a small detour from our route, but it was so worth it! 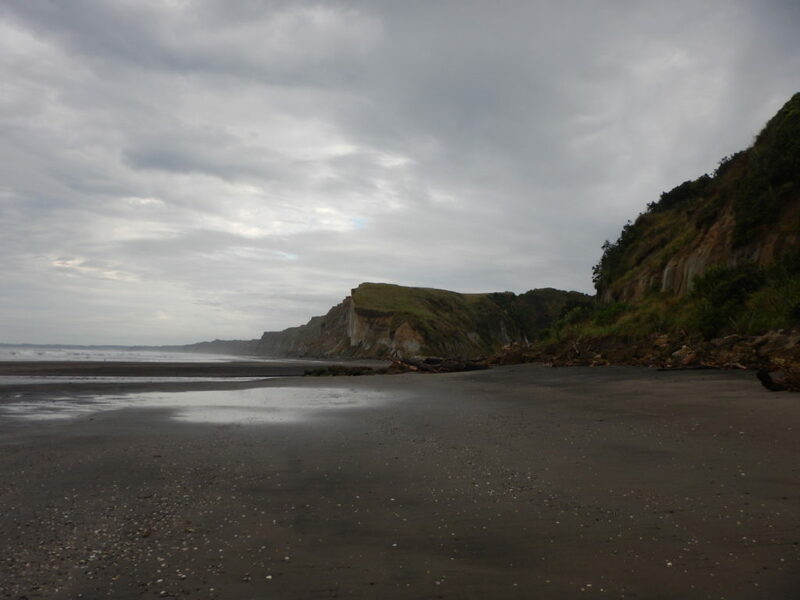 Just a few miles outside of Whanganui, you will find Kai Iwi Beach. This is notable because it has black sand! Because it was early and dreary, we had the beach to ourselves except for a local couple letting their dogs run. We were amazed by the black sand. It was low tide, so Boston had fun jumping over the puddles and throwing rocks. I love when you can have fun on the beach without a swimsuit! After we left the beach, we drove about an hour to Palmerston North. 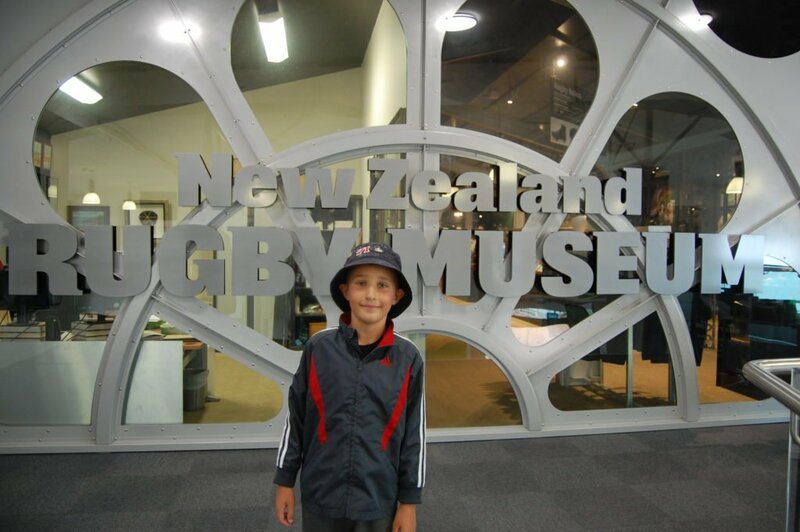 The main reason for our stop here was to visit the New Zealand Rugby Museum. This was Boston’s most anticipated activity. 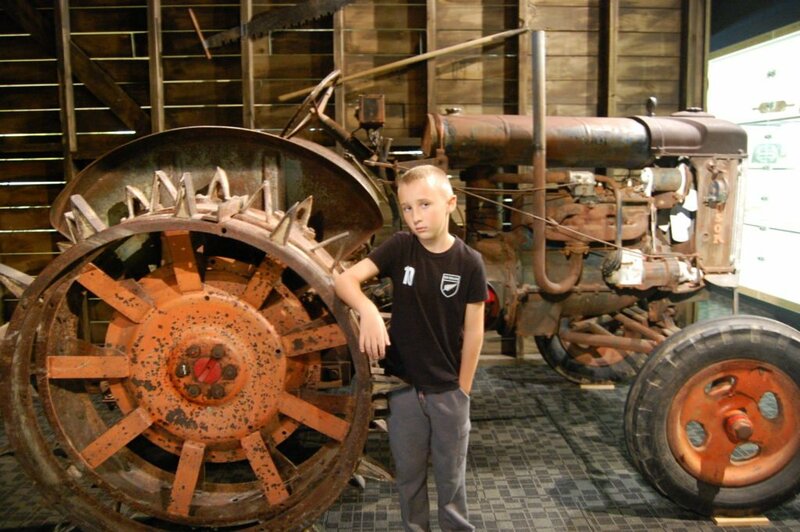 The Rugby Museum is small and housed in the same building as the Te Manawa museum, which is free. This was convenient because we could visit both without moving the car! Boston enjoyed testing out his rugby skills while Chris learned about the history of rugby. Boston bought a stuffed kiwi bird wearing an All Blacks shirt that says the haka. I quickly grew tired of hearing that bird! They both had fun in the Lego exhibit in Te Manawa, an arts, history, and science museum aimed at kids with lots of hands-on activities. The two museums can fill a few hours. After the museums, we were hungry. So, we headed to Speight’s Ale House for a late lunch. Chris and I had the ostrich burgers with apricot chutney. They were yummy! Boston ordered hot dogs but didn’t like them so he ate fries. We then checked into our hotel for the night: the Cornwall Motor Lodge. This place was small and cute. We had an upstairs room with interior stairs and a hot tub! I really liked this hotel because it was a short walk to the town square. After settling in, we walked back to the Square, a huge park right in the middle of the city. It had art pieces scattered around and a duck pond. Boston had fun chasing ducks and running around. We then found a mall and did a little shopping. We didn’t really find any treasures to buy, but Boston and I discovered a delicious treat: frozen yogurt! New Zealand has this dairy thing down! Because of our late lunch, none of us were hungry for dinner, so instead, we had dessert and drinks at Brew Union. The cheesecake was light and fluffy but was just ok. Chris enjoyed his beers. Shortly after 8 pm, we headed back to the hotel. Boston jumped in the hot tub with a bottle of milk before going to sleep. Another good day in the books. This morning, we checked out of the hotel, hit McDonald’s drive thru for breakfast, and then drove an hour or two to Wellington. What an amazing city! Chris and I wished we had more time to spend here. We arrived at around 11 am. It was cold and rainy all day. Originally, we had planned to go to the zoo first, but because of the weather, we nixed that idea. Instead of the zoo, we went to Te Papa first. 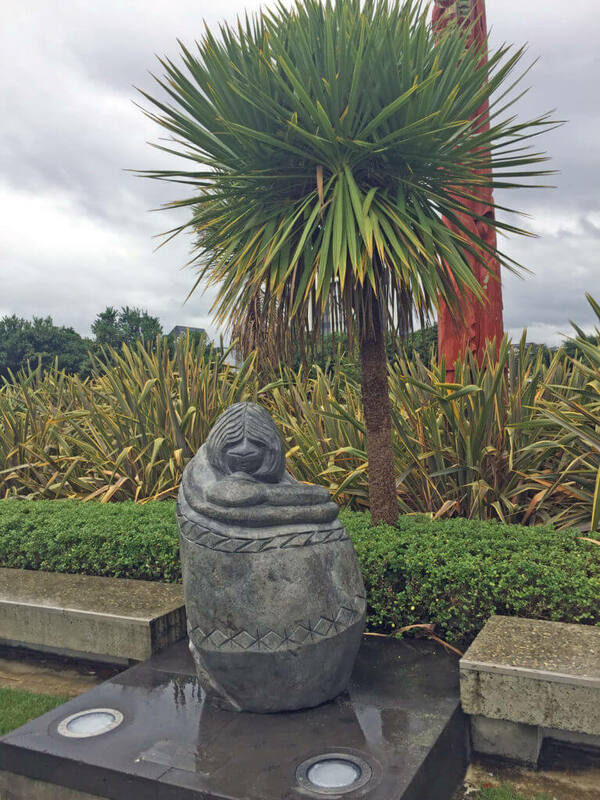 This is the official museum of New Zealand. It is free and the most amazing museum I have ever seen! It is a must-do if you are in Wellington. We were there for over two hours and didn’t even scratch the surface! It is 6 floors of awesome. 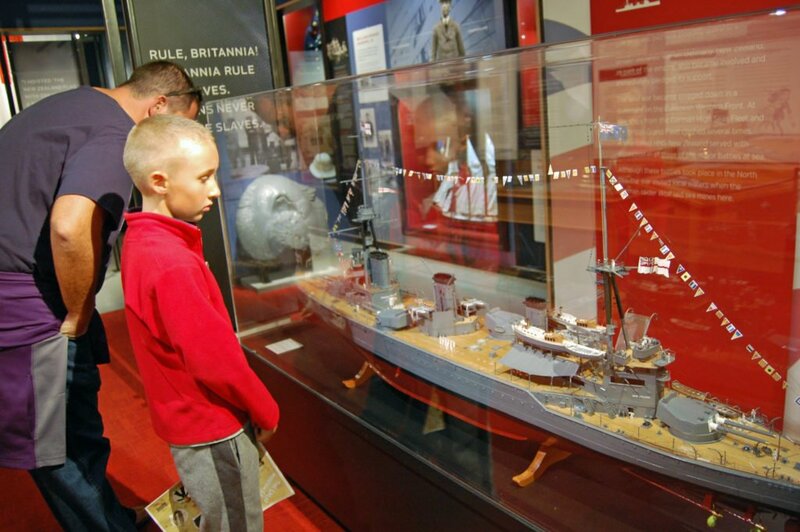 It has art, cultural artifacts, history, marine and nature, and lots of hands-on exhibits for kids. 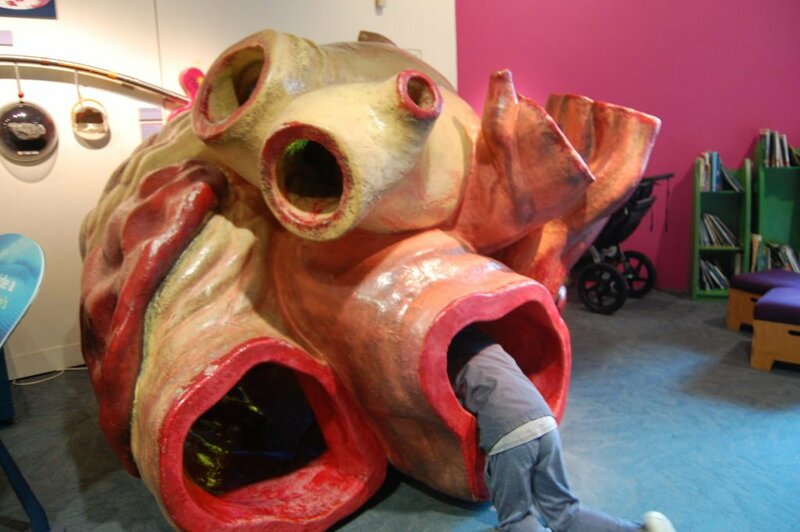 Boston got to climb through a life-size model of a blue whale heart. It was taller than Chris! My favorite exhibit was on the Gallipolli battle of WWI. 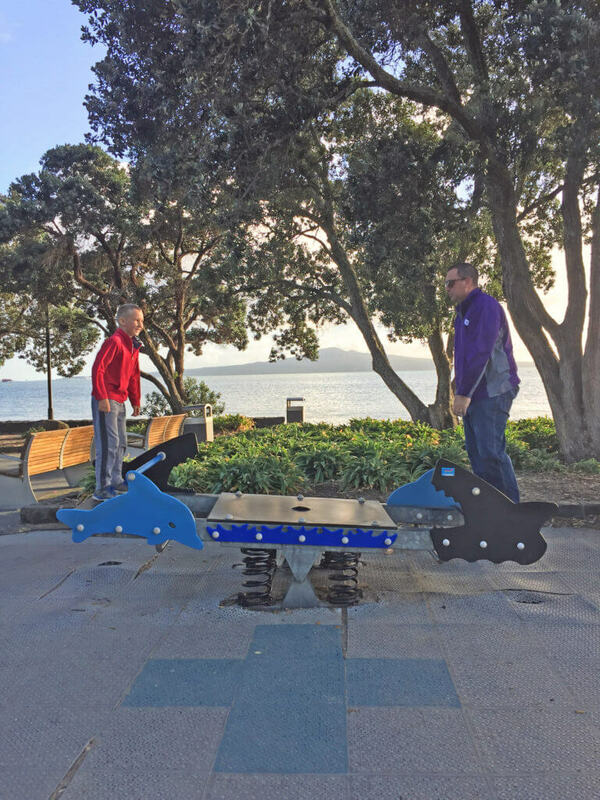 This was the biggest battle of the war for New Zealand. 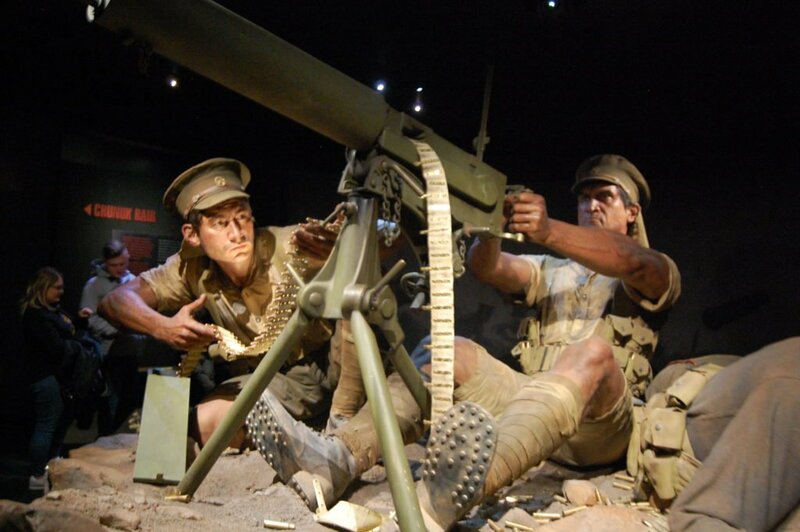 The highlight of the exhibit were 6 larger-than-life models of soldiers with incredible detail. The exhibit told the story of the battle through the eyes of these soldiers. Boston got scared about a third of the way through the exhibit and we had to rush through the rest of it. I could have spend a whole day just in that exhibit! We got a parking ticket while at Te Papa. Luckily, it was only $8 dollars though so not too bad! We left the museum when we got hungry. We drove a few blocks and checked into the hotel. The Astelia Apartment Hotel is a cute little apartment building in the middle of downtown Wellington. It is a great place for families. It even had a washer/dryer in the room. Staying in downtown turned out to be the best for us because the streets of Wellington are super narrow. It was easier to just walk everywhere. We went to dinner at Mama Brown. This place had a cool vibe with airplane seats as chairs. 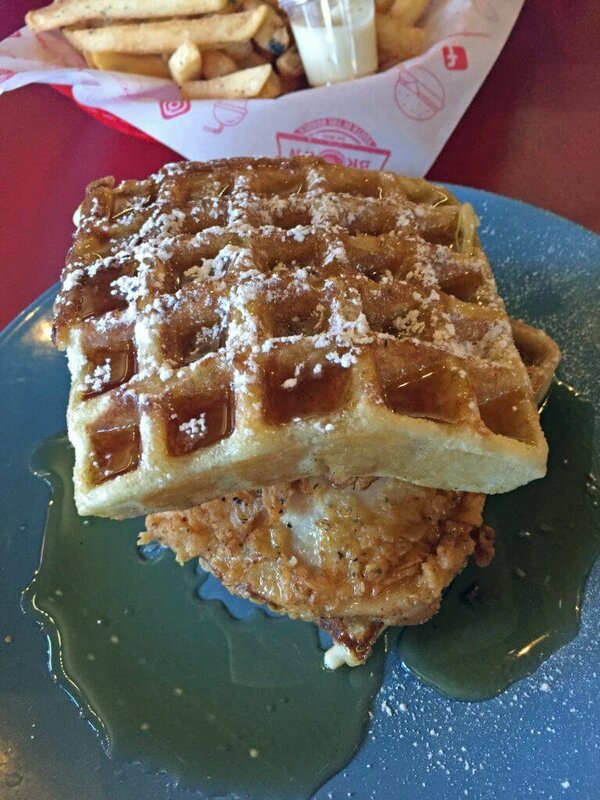 The chicken and waffles was better than any I have eaten in the States. Chris loved his pulled pork sandwich and Boston was impressed by his chicken and fries. This was the best place we ate the whole trip. After dinner, we shopped on Cuba Street. It is full of unique and trendy shops. Chris bought a hat and shirt while Boston got a book. Mom and pop shops are still alive and well in New Zealand, and Wellington’s Cuba Street is the capital! On our way back to the hotel, we grabbed some snacks. I did some laundry while Boston and I watched Hunchback of Notre Dame and Lilo & Stitch. Boston loved the Disney movie channel. Chris tried out a neighborhood bar. This was one of my favorite days. We woke up this morning to Boston with a full-blown cold. The weather had taken its toll on him. He was a trooper, though, and powered through. We had more cold, rainy weather today. Our breakfast place of choice was Floridita’s, a hip little cafe on Cuba St. It was pretty good. We took the Cable Car to the top of a big hill. 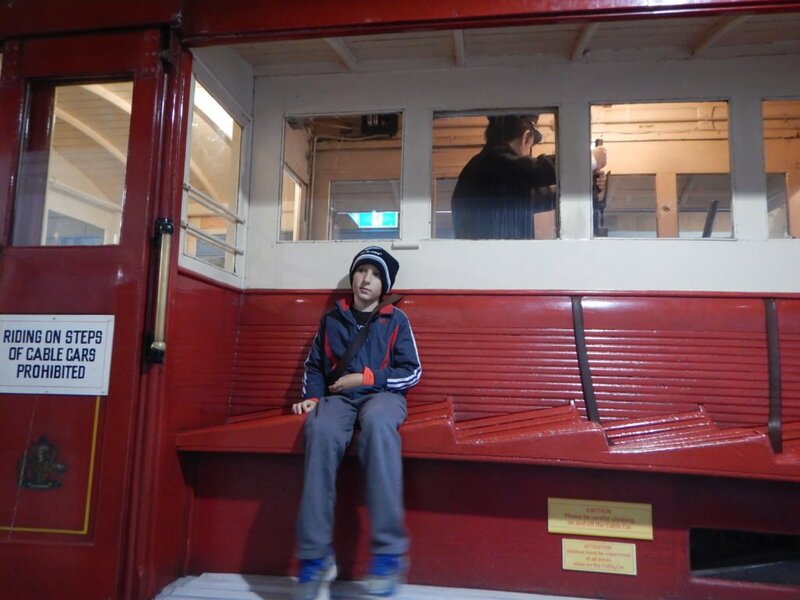 At the top, we went through the Cable Car Museum. It was small but had some of the old cable cars. Next, we explored the botanical gardens. This place is huge! 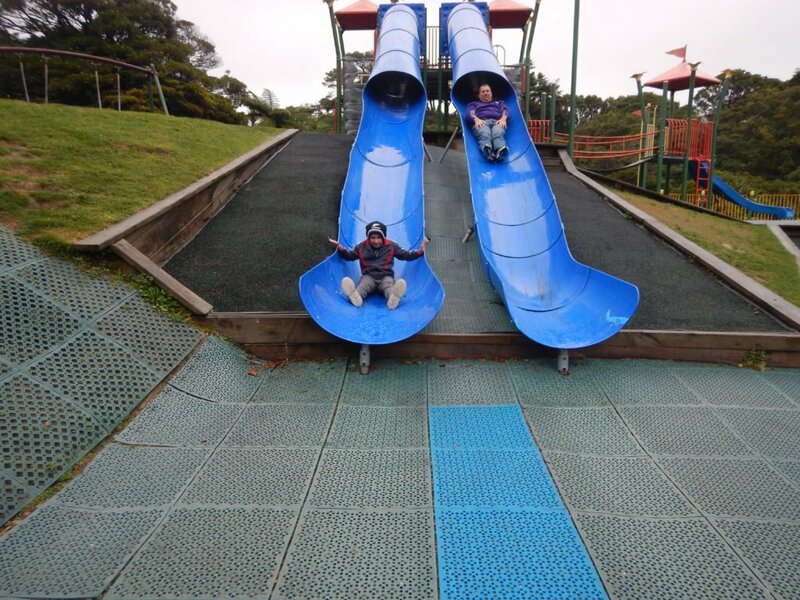 Boston and Chris raced down the slides and got their pants wet! Boston loved the zip line. Because of the weather, there were very few people in the gardens. 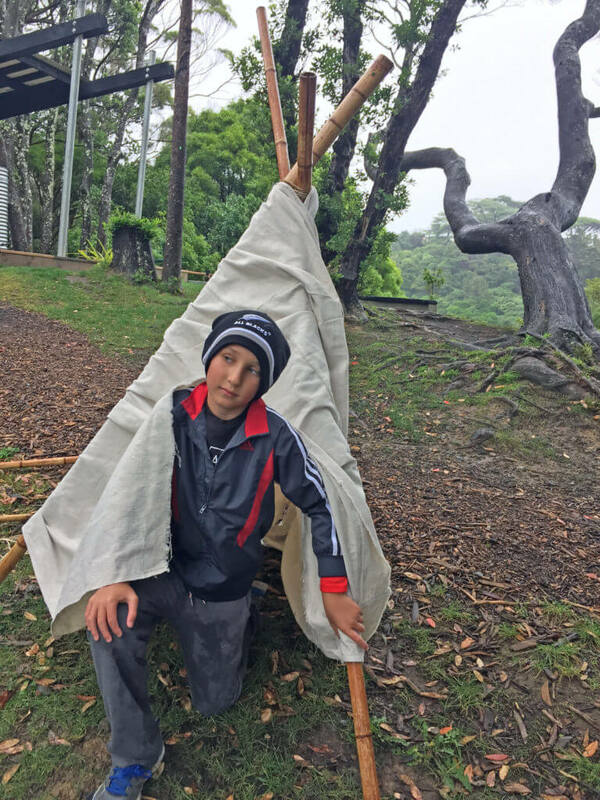 In the Discovery Garden, Boston did some exploring and then decided to build a teepee! After a couple hours, we took the cable car back down and went to the harbor. By this time, Boston was starving. So, we headed to the harbor in search of food. We decided on The Crab Shack. It was a nice place with a view of the water. Chris finally got the lamb he had been wanting. He liked it. I didn’t. After buying some souvenirs, we wandered down to the City to Sea Bridge. This is an artistic bridge that crosses a major road. It is made of reclaimed wood. It has huge sea gulls on one side and whale tails on the other. Our next stop was Frank Kitts Park so Boston could play on the playground. Afterwards, we headed back to the hotel to get warm and dry. Dinner was at Fork & Brewer. Chris really liked the Big Tahuna beer. The food here was not that good. We stopped on the way back to the hotel to get a pizza for Boston. 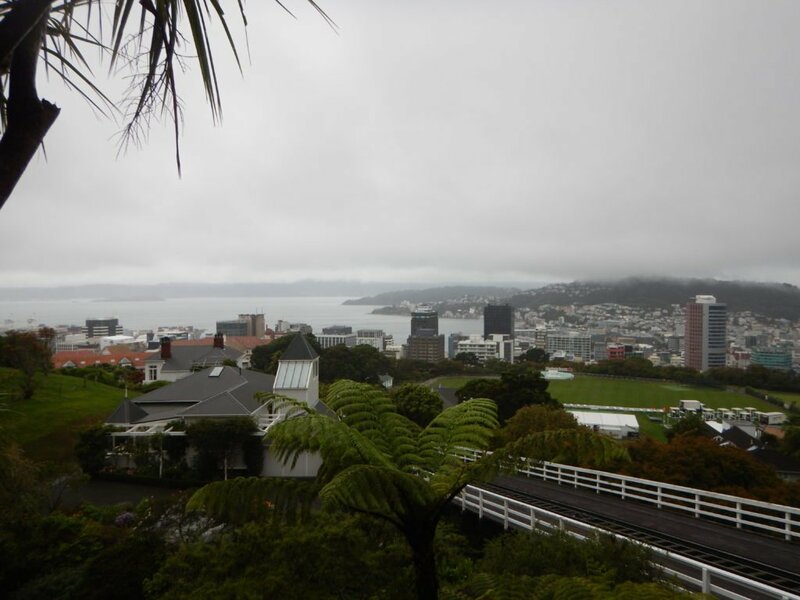 Our fun in Wellington has come to an end. It is now time to make the long drive back to Auckland. We left the hotel about 8:00 am, and swung through the McDonald’s drive thru for breakfast again. We stopped for lunch, gas, & shopping in Taihape, a quaint little town. Lunch was at Soul Cafe. It was a small cafe that was pretty yummy. I had a chicken pot pie which was really good. Boston got a t-shirt and some candy to take home. We stopped again in Taupo. Chris was still looking for a shirt, so we did some more shopping. Boston spotted a playground and begged to check it out. I took him to play while Chris shopped. 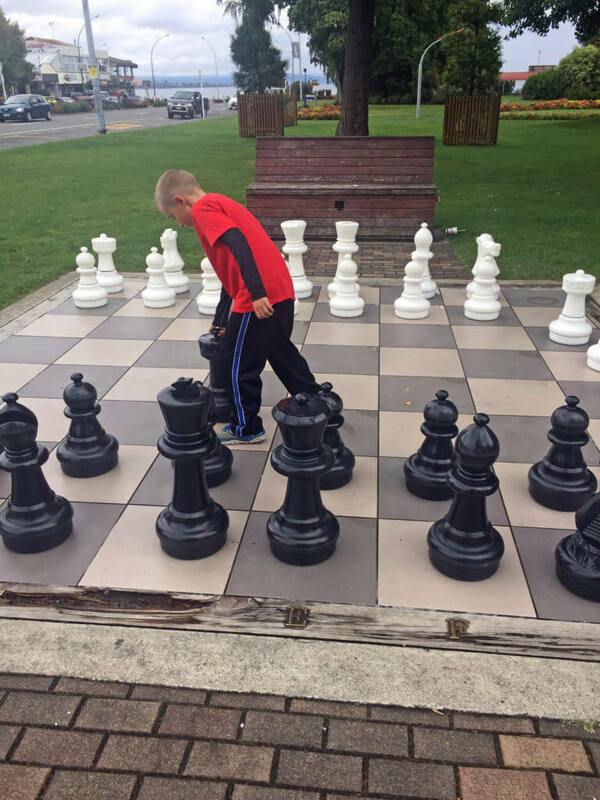 After some running and jumping, Boston spotted a giant chess set in the park. He started playing a game against himself when he was approached by a young man who asked for a game. I sat and watched the two of them play. The man won but was impressed with Boston’s skills. Boston said it was one of the most fun things he did during the trip. Our room for the night was at the Runciman Berry & Emu Bed & Breakfast. This was a b&b on an emu farm just outside of Auckland. I was hoping we would get there before dark so we could see the emus, but we hit traffic not far from the exit. This cost us an hour and we didn’t arrive until 8 pm. The innkeeper was super nice and brought us breakfast stuff soon after check in due to us leaving so early the next morning. The room was small, but it had a hot tub. We didn’t spend much time here since we arrived after dark and left before sunrise. The beds were not that comfy either. The alarm went off at 4:15 am. We got ready, had breakfast in the room and left. 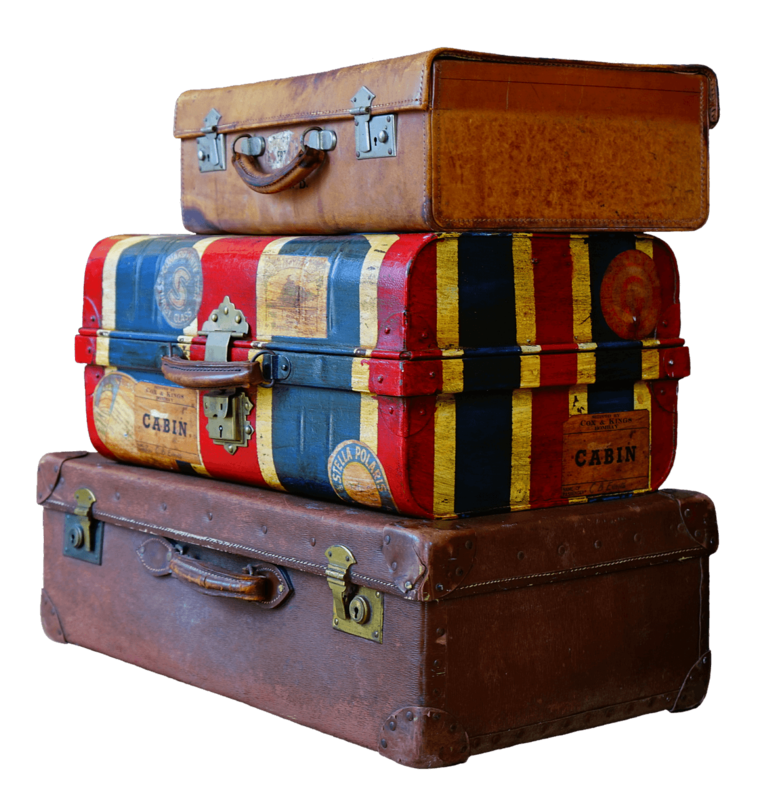 Soon, we reached the airport and quickly returned the rental car, and checked our luggage. We got to our gate about an hour early, so Boston was able to finish his homework. Customs and security were super easy this morning. We had an uneventful flight back to Samoa. We went back to the Sheraton Samoa Beach Resort for the night. Boston went to the Kids Club to play for an hour while Chris and I enjoyed Happy Hour and the view. Boston was starving so he had a pizza as an early dinner. Chris and Boston went swimming while I took a nice bath. When the restaurant opened, Chris and I had dinner while Boston played on his tablet. The steak was good but the lemon custard was a disappointment. After dinner, Boston and I watched TV while Chris hung out at the bar. The next morning, we had breakfast at the resort. Boston and Chris swam in the pool again. Before long, we were packing up and checking out of the resort. We took a cab to the airport and then made the short flight back home. This was one of the best vacations ever. New Zealand is a beautiful country with tons of amazing things to see and do. We loved our time there. It was nice to be able to do a road trip too. We haven’t done one in a while. Hopefully, there is another New Zealand road trip in our future, and yours too. Happy travels!